We built our IDF: Israel Defense Forces expansion book around an odd artifact of our past game production: a set of blue Israeli playing pieces for Panzer Grenadier (Modern): 1967 Sword of Israel, an alternative to the white pieces included in the game. The game’s first printing had laser-cut pieces that were . . . not good, and the blue background we used for the replacements helped cover some of the flaws. We stopped used laser-cut pieces some time back; even with a better supplier, we still had far too many rejects. The silky-smooth, die-cut pieces we use now are much nicer, and the quality is just immensely better. So we went with white Israelis in the recent printings of 1967 Sword of Israel, but we still had the files for the blue version, and some folks kept asking for them. So we decided to print some, as a special Gold Club sales incentive when we brought 1967 Sword of Israel back into print with silky-smooth pieces. The silky pieces are exquisite, starting with their silky coating. Along with the smoothness on both sides (no more “bathtub effect” on the back from getting smashed by a heavy die), the color reproduction is very rich and the print sharpness is the best I’ve ever seen in a game part. These really are a pleasure to handle. I didn’t want to just make the pieces though; while the Gold Club’s ranks have been growing, we’d have a lot of them left over. 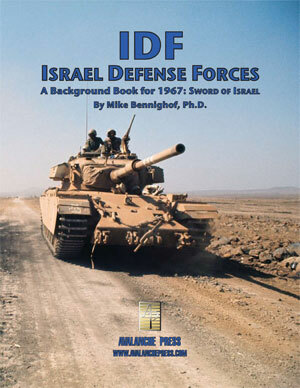 So I decided to wrap a book around them, focused on the Six Day War (the theme of 1967 Sword of Israel), and that’s the genesis of IDF: Israel Defense Forces. Those blue Israelis remain the main event, of course. There are 264 of them – by odd coincidence, exactly one and one-half sheets of pieces (which is what lets us print these separately). They’re identical to those included in 1967 Sword of Israel, except for one key difference: they’re blue. So you don’t really need these pieces, but let’s face it: if you’re still reading this, you need these pieces. The book is more than just a wrap for the pieces. I wanted 1967 Sword of Israel to have a companion book, talking about the war and the armies that fought it, and relating that history to the game. Combat in 1967 was significantly different from that of 1951 (the time of our Korean War games), with the coming of anti-tank missiles, helicopters, and simply far more capable armored fighting vehicles than those of World War II (even if some veteran tanks from that conflict are still around). It’s still Panzer Grenadier, though, to the extent that you can play those Korean War scenarios with the Modern rules and they work (some of them are off in terms of play balance, because of the difference in stacking limits, but the mechanics themselves won’t stop play). The Israel Defense Forces are at the extreme end for Panzer Grenadier ratings; their morale and initiative are almost always excellent, they have great leaders and plenty of them, and they usually have numbers, too – the David vs. Goliath narrative of this war is a myth. The Egyptians are poorly led, the Jordanians are actually pretty good but usually not as good as the Israelis, and the Syrian Arab Army followed a policy of identifying and promoting the stupidest possible officer candidates to remove form power anyone capable of executing a military coup. We delve into how and why all of that came to pass, and what it means in game terms. You can beat the IDF on the battlefield – but you have to be at the top of your game. 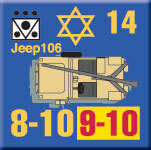 1967 Sword of Israel appeared before the development of the battle games that are now standard in Panzer Grenadier games. The battle games tie together scenarios that took place as part of a single battle, with common victory conditions. You can still play them separately, or you can play all of them to trace the flow of the campaign and try to achieve a broader victory. In 1967 Sword of Israel the action takes place in restricted geography, and over a brief stretch of time: the Six Day War didn’t see fighting everywhere on all six days. The war in Sinai lasted four days, that on the West Bank two days and another two days on the Golan Heights. That provides plentiful opportunities for battle game sequences, so we’ve added a set of 1967 Sword of Israel battle games to the IDF book. 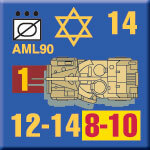 Even though 1967 Sword of Israel has plenty of scenarios (fifty of them! ), for some reason there’s one small front left out. At the far southern end of the Sinai frontier, Col. Albert Mendler’s 8th Armored Brigade squared off with the Egyptian 6th Mechanized Infantry Division. The Egyptians expected a major effort here, as had occurred in 1956, and they expected good things from the well-equipped division guarding this back door to Sinai. They had the benefit of some fairly intense fortifications, while the two-battalion Israeli brigade was equipped with unmodified Sherman tanks and never intended to actually carry out an assault, only to make a feint. Mendler, being an Israeli armored commander, of course attacked anyway with unexpected success; his brigade would soon be shifted north to face the Syrians on the Golan Heights. So we have a series of scenarios from this tiny segment of the Six Day War, and a battle game to tie them together. 1967 Sword of Israel is the largest (and therefore most expensive) game in our catalog, and as such it gives a lot of play value – fifty scenarios involving three battle fronts and four armies. Until now it’s been lacking a “fun multiplier” like many of the Panzer Grenadier games already have, an expansion book with more pieces and more background on the campaign and the armies. 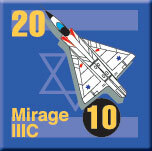 IDF: Israel Defense Force does that for 1967 Sword of Israel. The battle games alone add enormously to the potential fun. Plus you get more scenarios and the stories behind the game and its pieces. 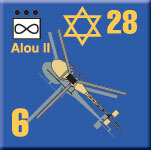 But best of all, you get more pieces: A glorious indulgence of pieces, 264 blue Israelis that you absolutely must have.